Eat a varied diet (or as varied as a toddler’s eccentric tastes allow) with sufficient calories for normal growth. Get from 25% to 30% of their total calories from fat. No more than one-third of these (10% of their total calories) should come from saturated fat (found in dairy products, meats and egg) and trans-fats, such as any items with hydrogenated shortening, should be close to zero as possible. The rest should come from polyunsaturated fats (found in corn, safflower, sunflower and soyabean oils) and especially from monounsaturated fats (found in olive and canola oils), which are believed to be the best fats for heart health. Get less than 300 milligrams of dietary cholesterol per day, unless there’s a strong family history of high cholesterol (in the case, the level should be under 200 milligrams). Cholesterol is found in animals products, such as eggs, meat poultry, whole milk, cheese and other dairy products. To compensate for the reduction in fat, your toddler’s diet should be huge in filling, fiber-rich whole grains, legumes, fruits and vegetables, and include moderate amounts of low fat dairy products, meat, poultry and fish. And to further reduce the risk of plaque in the arteries, she should be encouraged to be physically active and spend little time watching television. Children who watch a lot of TV tend to have higher cholesterol levels – not only because they snack on high-fat foods while watching, but because they’re sitting in front of the TV instead of getting cholesterol reducing, health promoting exercise. 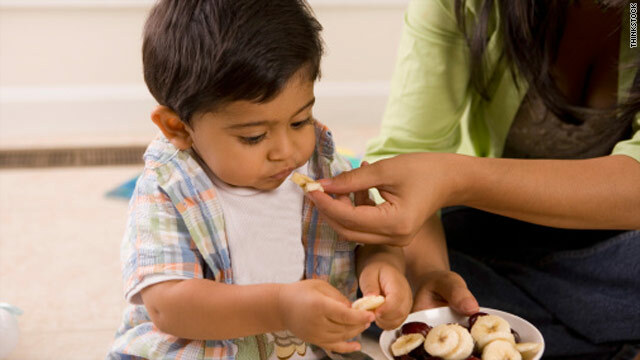 But keep in mind as you go about modifying your toddler’s diet, that there’s a limit to how much you can, and should, limit a child’s cholesterol and fat intake. An overly restrictive diet, in fact, poses several problems. First, children need fat to grow, both physically and intellectually; weight, height, and the ability to learn can be adversely affected by a diet that’s too low in fat. Second, a totally fat-free diet can be unappetizing and tough to chew (a definite drawback for those still perfecting the skill). Third, fat-free meals don’t stick to the ribs as long, making chronic hunger – and sagging energy between meals – potential problems. Fourth, in severely restricting certain foods that are naturally moderate to high in fat, dairy products, for example, there’s the risk that vital nutrients in these foods will also be restricted. In the U.K., the Government’s Committee on Medical Aspects of Food Policy (COMA) recommends that children over two can be given semi-skimmed milk if they are eating a diverse diet, but that skimmed milk is not appropriate for children under five. And last, as with any overly restrictive diet, fat-free regime can lead to mealtime rebellion and unhealthy attitudes towards food, particularly once your child starts seeing that the other kids are eating what she’s never allowed. Not unless there’s a good reason- and concern over your toddler’s future cardiac health isn’t reason enough. It’s presently recommended that a child’s cholesterol level be tested when there is a family history of onset of heart disease before age 55, or when at least one parent has evaluated cholesterol reading (240 mg/dL or more). If there is such a history, or the family history is unknown, talk to your toddler’s doctor about testing. Children who have high cholesterol levels should, like all over-two’s, be put on the low-fat, low-cholesterol diet readings, a step two diet is usually prescribed. The diet reduces saturated fat intake to less than 7% of total calories and limits cholesterol less than 200 mg a day.